My (Neil’s) parents have a great house out in the country and they grow a plethora of things. Sometimes I think they grow things just to grow things, and in this particular case I was right. They had a few habanero plants growing and had no idea what use these little hot peppers would be. Well I am a fan of all things spicy, so I mentioned that I would take some. Well about a week later I get, literally in a box in the mail, with about 3 dozen peppers or so (that is so something my mom would do). 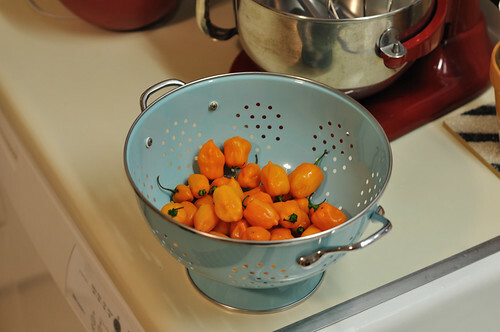 If you do not know how hot these little guys are, take a look at this wikipedia entry that explains the Scoville units. Compared to a jalapeno that contains between 70,000-100,000 scolville units, the habanero contains between 100,000 and 350,000 scolville units. 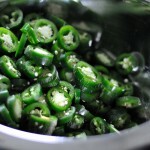 These are much hotter than jalapenos. So where to begin? Well using guidance from a great recipe blog, we found out that it was quite easy to make jam out of most anything. First you need to get set up with gloves as you do not want the oils of this hot pepper on your hands or anywhere you touch for days! 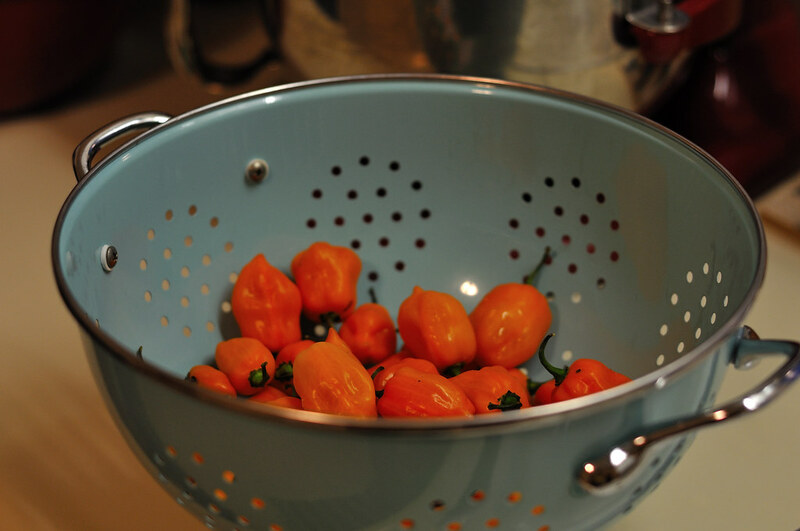 We washed and strained our peppers and put them in a metal container. 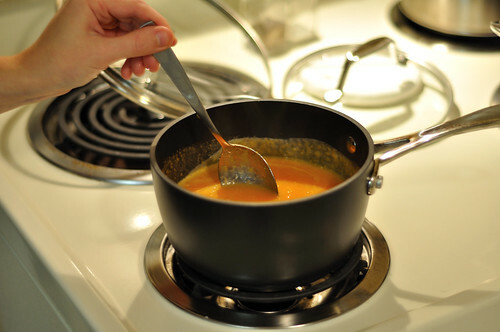 You should make it a point to not use any porous utensils as they will hold the oil and might make them hard to use in the future for some time. 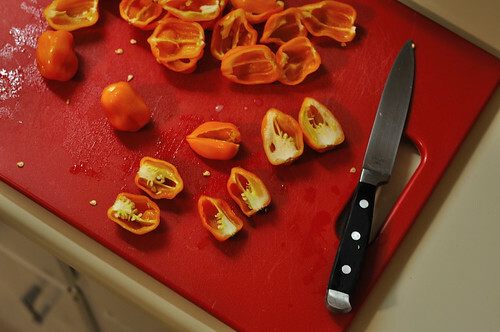 Next, with gloves on, you need to slice the peppers into halves and pull out the seeds and membranes and put them into a plastic bag or something that you can toss in the trash. Keep in mind that in the seeds and membranes is where the HEAT is, so if you want a hotter jam, leave some in and it will certainly do the job. Otherwise remove all of them. After you’ve sliced them all, cut them again into quarters and put them into whatever you have to chop them. A food processor is best, however we do not have one yet, so we used a coffee grinder! Our blender was too big to contain and process them small enough and the coffee grinder was the next best thing. Wonder how spicy my coffee is going to be next time? ha ha ha! Okay, before you move onto cooking these bad boys, you have to get your canning jars ready and sterilized. If you are new to this process here is a great guide. Since this takes a good amount more time than the cooking of the peppers, I would start this process well before cooking the peppers. 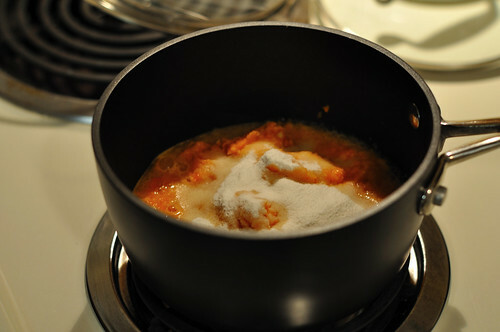 Put all of the ingredients (minus the sugar, that goes in later) into a pot and bring it to a boil. After you bring mixture to boil, add the sugar and begin to stir ferverently and constantly for only ONE MINUTE. The sugar is going to make things pretty sticky, so work quickly and reduce the heat a bit so you don’t burn. After the minute mark remove from heat and get your jars ready to ladle the mixture into them. 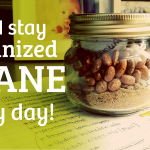 After you have them in your canning jars, put on the lids and just barely tighten them and send them back into the boiling water you used to sterilize them for another 10 minutes. After that you can remove them and put them back on a cooling rack and you are done! 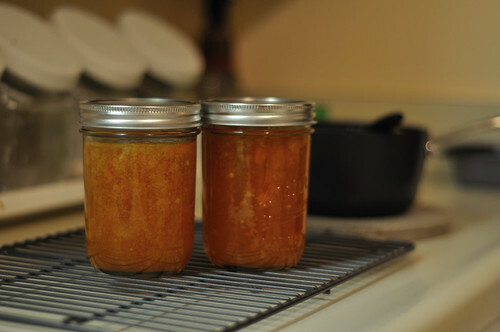 Our habanero jam is the culmination of a year-long education and experiment with gardening and growing our own food. It’s an incredibly liberating feeling to not only know where our food is coming from but also that we’ve gained an awareness to never run out of ways to cook things. We used to perceive canning as an arduous and outdated practice but it’s not only incredibly easy, it’s very frugal and resourceful. Long gone too are our prejudices that you have to live in the country and have a huge garden. We have a pantry full of canned vegetables and salsa from our tiny backyard plot. Rainy, murky, dreary and wet. I’ll have to say that making jelly is the biggest canning fear I have. 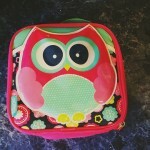 I am so overwhelmed by the possibilities for your jam…biscuits, stews, pasta, etc…all sorts of tasty, spicy foods! I wonder how hard it is to can some of the tropical fruits here in Hawaii…. Your directions are awesome, I just don’t know about Jam. Personally I like things either Spicy or Sweet. I’ve never been a fan of the Sweet and Spicy in terms of Jams and Jellys, but like I said that’s a personal. This looks like a good recipie! I argue with the gloves for Habanero’s! Its more fun if three days after the fact you touch the corner of your eye and you get that pain! Not to be totally gross, but I stuck my finger in my nose, and…ouch. Even with gloves it ends up places you don’t want it to. We got home from work yesterday to a little puke spot, and we think Felix NOM’d a seed. We’ll bring my uncles jalapeno jam to New Year’s. It’s more sweet than spicy, almost like eating a salsa. 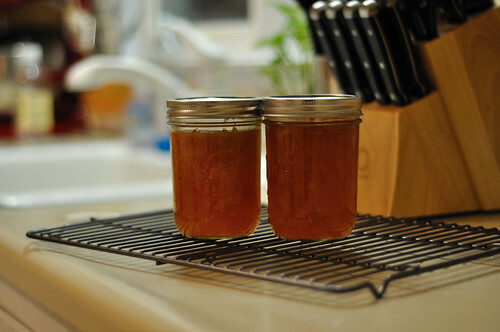 @Sam, I was always scared, but with the pectin and tons of sugar, it jellies pretty much on its own within a minute! It would be so awesome to can some of those fruits! 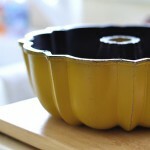 I really, really, really want to make this.